On my last evening in Europe – well, on the European mainland, anyway – I could post some pretty pictures of Bruges, which is indeed Very Pretty, and say, Dear Belgium, all is forgiven. But I won't, as all isn't. 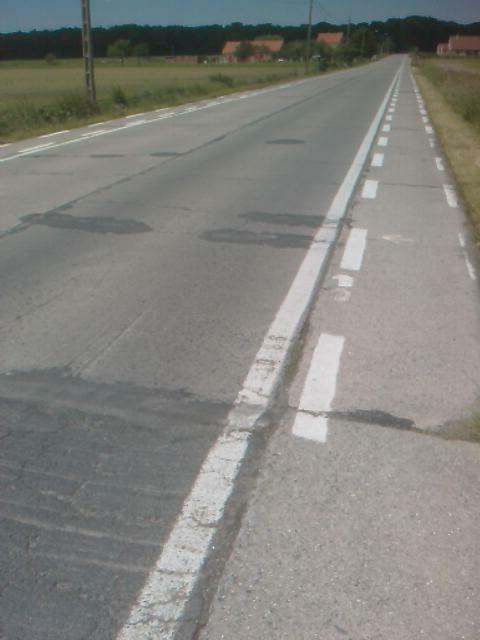 To the bitter end, Belgium's road surfaces were s**t, often consisting (see pic) of lumpy concrete poured in a road-building style that went out of fashion elsewhere in Europe with Hitler's autobahns in the 1930s. Big bumps every three metres, and not much fun for a Fietser, a Kerekpar or a bike. Also, Bruges was EXPENSIVE. To the point of being a tourist rip-off. Four quid a beer. Evening meal of (small) portion of chips and half a (small) grilled chicken? Little change from 20 smackers. But hey, the frites, on their own from a small roadside stall, were as brilliant as their reputation. Indeed, there's a museum in Bruges dedicated solely to Frites. 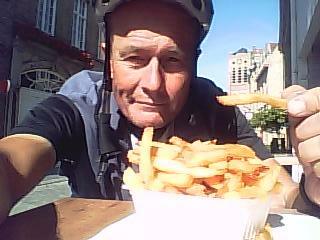 Ought to be called Belgian fries, not French fries. Also see satisfied pic, with tourist church tower in the background. Delivered to the table by the friteur with an "Enjoy Your Meal, Sir". I did. But I enjoyed even more reaching France an hour later. No cycle tracks, but good roads, and cycle-considerate drivers. So, Dunkirk ferry to Dover in the morning and after three months and well over 6000 kilometres, it's not just bye-bye Belgium but bye-bye continental Europe. I'll pen some mighty pilgrimage-concluding mots on the boat, so for the moment, a few further random observations at this interesting, even a bit disconnected point on a journey I am beginning to realise I will rather miss. For instance, how do you navigate in a country that has virtually no road signs? Without a compass – I chucked my old plastic one away just outside Berlin when it started giving me different Norths depending which direction I was pointing – I've developed a nifty system of using Raven's shadow as a kind of direction-finder. Taking account of the time of day, the outline cast by bike-and-rider tells me where is East is in the morning, South at midday and West in the evening. Duhh. It's worked brilliantly, although it does get a bit unreliable when it's pouring with rain, as it did again much of yesterday and this morning. Still, combined with a 1:500,000 map (one cm = 5 km), it's got me to the Channel from Berlin, with only a couple of wrong turnings. It's asparagus time in Europe, with "asperges" posted for roadside sale all over this French- and Dutch-speaking part of the continent. Do you think someone with dyslexic tendencies who can't register other people's emotions properly, and who has an excessive appetite for fresh vegetables, might have Asparagus syndrome?